Plus incomplete lists for his solo album and records he’s producing for Nas and Teyana Taylor. 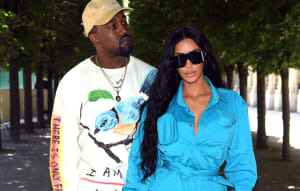 Kanye West returned to Twitter on Tuesday afternoon to share a video of himself working on new music, with whiteboards in the background displaying tracklists for the five albums Kanye announced he was producing back in April. The video displays what appears to be more developed tracklists for Pusha T's upcoming project and Kanye's collaboration with Kid Cudi, which is called Kids See Ghosts. The listings for albums by Nas, Teyana Taylor, and Kanye's solo album, are more incomplete. Each album is seven songs long with the exception of Pusha T's. After extremely disheartening month that saw Kanye embrace Donald Trump and the far-right, Kanye announced that he was returning to Wyoming to finish the albums. Thankfully, Kanye's controversial "free thinking" tweet storms ended after a visit to TMZ saw him get verbally smacked down by Van Latham. 1. "If You Know U Know"
7. "How Do You Respond"